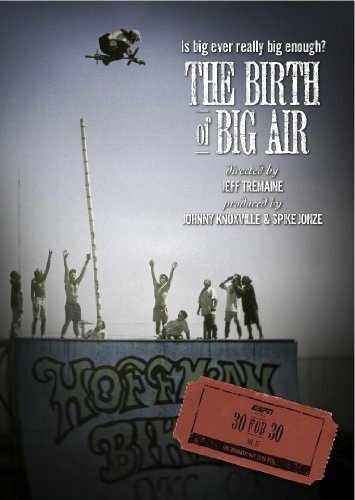 The Birth of Big Air is a 2010 documentary about professional BMX star Mat Hoffman. It’s directed by Jeff Tremaine and produced by Spike Jonze and Johnny Knoxville as part of ESPN’s 30 for 30 series. You might recognize Jeff Tremaine, Spike Jonze, and Johnny Knoxville from their work on MTV’s Jackass. All three of them were so impressed with Hoffman’s badassery that they decided to make a movie about him. Hoffman was a pioneer in the sport. He was always creating new tricks, getting more and more big air, and pushing the sport into the mainstream. He partially saved the sport in the early ‘90s when sponsors and contests dried up. He created his own company, organized his own events, and kept on developing new tricks. He wasn’t doing it for money. He was doing it for himself. The filmmakers stress that Hoffman is more than an athlete. He is a gladiator. He punishes his body. He’s broken practically all his bones, he ruptured his spleen, he’s been in a couple of comas, and he’s almost died several times. But he always gets back up and gets back on his bike. It’s what he does. It’s who he is. Along the way he inspired thousands of kids to get on a bike and go outside. The documentary explores Hoffman’s influence on BMX and the X Games lifestyle. He was building his own megaramps years and getting twenty feet of air years before anyone else was brave enough to try it. He showed people that it was possible. He paved the way for the spectacle that the X Games have become. Mat Hoffman is a different breed of human. If Charlie Sheen has tiger blood, Mat Hoffman has liger blood. And yes, I just referenced Charlie Sheen’s #Winning phase and Napoleon Dynamite.